During my annual winter blogging break, I'll be posting some of my favourites from back in 2013. 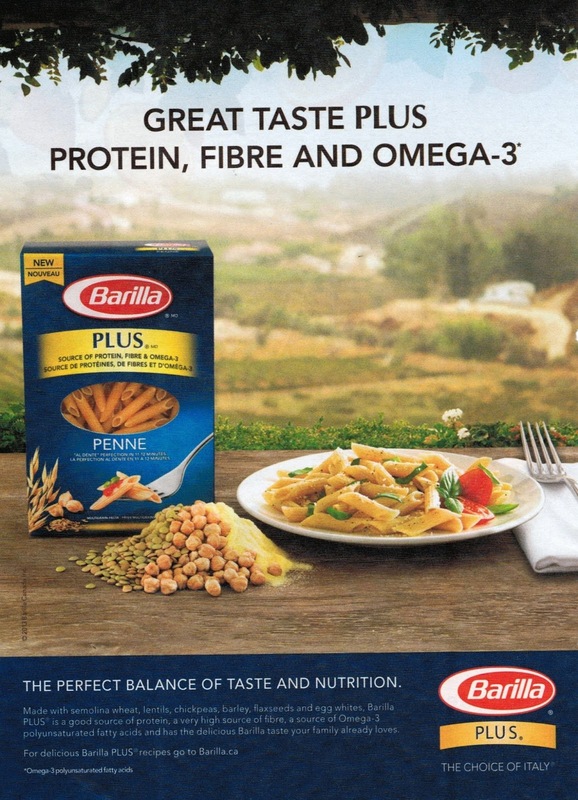 Today's badvertising comes from Barilla Plus Omega-3 pasta. If you were duped by the health washed packaging of Barilla Plus pasta and thought you could consume it as a means to acquire healthy omega 3 DHA fatty acids, to obtain the equivalent amount of DHA that you'd get from eating a teeny weeny 2.6oz serving of salmon you'd need to eat between 11 and 201 POUNDS of pasta (with the amount depending on your body's ability to convert plant based ALA to DHA). Bon appetit. And wear stretchy pants. Depending on your source of information between a low of 0.5% and a high of 9% of plant sourced alpha linolenic acid (ALA) is converted by the body to DHA. 75g of salmon contains 1,610mg of DHA. 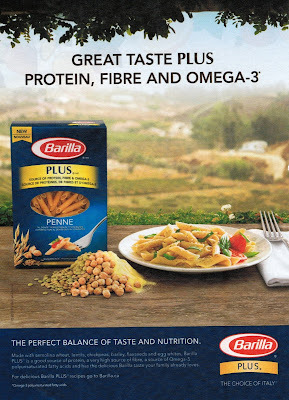 An 85g serving of Barilla Plus contains 300mg of flaxseed sourced ALA.
0.5% to 9% of 300mg = 1.5mg to 27mg.